Creating Integrated Value, or CIV, is an important evolution of the corporate responsibility and sustainability movement. It combines many of the ideas and practices already in circulation – like corporate social responsibility (CSR), sustainability and creating shared value (CSV) – but signals some important shifts, especially by focusing on integration and value creation. More than a new concept, CIV is a methodology for turning the proliferation of societal aspirations and stakeholder expectations – including numerous global guidelines, codes and standards covering the social, ethical and environmental responsibilities of business – into a credible corporate response, without undermining the viability of the business. Practically, CIV helps a company to integrate its response to stakeholder expectations (using materiality analysis) through its management systems (using best governance practices) and value chain linkages (using life cycle thinking). This integration is applied across critical processes in the business, such as governance and strategic planning, product/service development and delivery, and supply and customer chain management. Ultimately, CIV aims to be a tool for innovation and transformation, which will be essential if business is to become part of the solution to our global challenges, rather than part of the problem. Creating Integrated Value (CIV) is a concept and practice that has emerged from a long tradition of thinking on the role of business in society. It has its roots in what many today call corporate (social) responsibility or CSR, corporate citizenship, business ethics and corporate sustainability. These ideas also have a long history, but can be seen to have evolved primarily along two strands – let’s call them streams of consciousness: the responsibility stream and the sustainability stream. The responsibility stream had its origins in the mid-to-late 1800s, with industrialists like John D. Rockefeller and Dale Carnegie setting a precedent for community philanthropy, while others like John Cadbury and John H. Patterson seeded the employee welfare movement. Fast forward a hundred years or so, and we see the first social responsibility codes start to emerge, such as the Sullivan Principles in 1977, and the subsequent steady march of standardization, giving us SA 8000 (1997), ISO 26000 (2010) and many others. The sustainability stream also started early, with air pollution regulation in the UK and land conservation in the USA in the 1870s. Fast forward by a century and we get the first Earth Day, Greenpeace and the UN Stockholm Conference on Environment and Development. By the 1980s and 1990s, we have the Brundtland definition of ‘sustainable development’ (1987), the Valdez Principles (1989, later called the CERES Principles) and the Rio Earth Summit (1992), tracking through to standards like ISO 14001 (1996). As these two movements of responsibility and sustainability gathered momentum, they naturally began to see their interconnectedness. Labour rights connected with human rights, quality connected with health and safety, community connected with supply chain, environment connected with productivity, and so on. The coining of the ‘triple bottom line’ of economic, social and environmental performance by John Elkington in 1994, and the introduction of the 10 principles of the UN Global Compact in 1999 reflected this trend. We also saw integration start to happen at a more practical level. The ISO 9001 quality standard became the design template for ISO 14001 on environmental management and OHSAS 18001 on occupational health and safety. The Global Reporting Initiative and the Dow Jones Sustainability Index adopted the triple bottom line lens. Fair Trade certification incorporated economic, social and environmental concerns, and even social responsibility evolved into a more holistic concept, now encapsulated in the 7 core subjects of ISO 26000. At every stage in this process, there have been those who have challenged our understanding of the scope and ambition of corporate responsibility and sustainability. Ed Freeman introduced us to stakeholder theory in 1984, John Elkington to the ‘triple bottom line’ in 1994, Rosabeth Moss Kanter to ‘social innovation’ in 1999, Jed Emerson to ‘blended value’ in 2000, C.K. Prahalad and Stuart Hart to ‘bottom of the pyramid’ (BOP) inclusive markets in 2004, and Michael Porter and Mark Kramer to ‘creating shared value’ (CSV) in 2011. Typically, these new conceptions build on what went before, but call for greater integration and an expansion of the potential of business to make positive impacts. 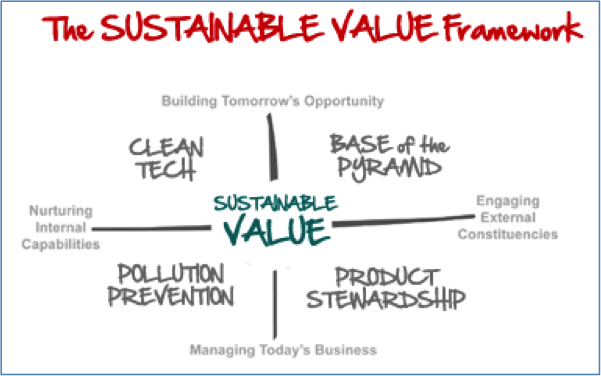 For example, Hart’s ‘sustainable value’ framework (2011) incorporates pollution prevention, product stewardship, base of the pyramid (BOP) and clean tech. Emerson’s ‘blended value’, much like Elkington’s ‘triple bottom line’ looks for an overlap between profit and social and environmental targets, while Porter and Kramer’s CSV focuses on synergies between economic and social goals. Creating Integrated Value (CIV) takes inspiration from all of the thought pioneers that have gone before and tries to take the next step. CIV is not so much a new idea – as the longstanding trend towards integration and the ubiquitous call for embedding of standards testifies – but rather an attempt to work out the ‘how to’ of integration. When companies are faced with a proliferation of standards (Standards Map alone profiles over 150 sustainability standards) and the multiplication of stakeholder expectations, how can they sensibly respond? We have analysed some of the most important global guidelines, codes and standards covering the social, ethical and environmental responsibilities of business – such as the UN Global Compact, OECD Guidelines for Multinational Enterprises, ISO 26000, GRI Sustainability Reporting Guidelines (G4), IIRC Integrated Reporting Guidelines, SA 8000, UN Business & Human Rights Framework and Dow Jones Sustainability Index. Our experience of working with business shows that most companies respond piecemeal to this diversity and complexity of S2QE3LCH2 issues (let’s call them SQELCH for short). A few large corporations use a management systems approach to embed the requirements of whatever codes and standards they have signed up to. Even, so they tend to do this in silos – one set of people and systems for quality, another for health and safety, another for environment, and still others for employees, supply chain management and community issues. CIV, therefore, is about knocking down the silos and finding ways to integrate across the business. In short, CIV helps a company to integrate its response to stakeholder expectations (using materiality analysis) through its management systems (using best governance practices) and value chain linkages (using life cycle thinking). This integration is applied across critical processes in the business, such as governance and strategic planning, product/service development and delivery, and supply and customer chain management. And what about value? Most crucially, CIV builds in an innovation step, so that redesigning products and processes to deliver solutions to the biggest social and environmental challenges we face can create new value. CIV also brings multiple business benefits, from reducing risks, costs, liabilities and audit fatigue to improving reputation, revenues, employee motivation, customer satisfaction and stakeholder relations. Our experience with implementing and integrating existing standards like ISO 9001 and ISO 14001 convinces us that, in order for CIV to work, leaders need to step up and create transformational goals. Without ambition ‘baked in’ to CIV adoption, the resulting incremental improvements will be no match for the scale and urgency of the global social and environmental crises we face, such as climate change and growing inequality. One of the most exciting transformational agendas right now is the Net Zero/Net Positive movement, which extends the ‘zero’ mind-set of total quality management to other economic, social and environmental performance areas. For example, we see companies targeting zero waste, water and carbon; zero defects, accidents and missed customer commitments; and zero corruption, labour infringements and human rights violations. These kinds of zero stretch goals define what it means to be world class today. In practice, CIV implementation is a 6-step process, which we can be described as: 1) Listen Up! (stakeholder materiality), 2) Look Out! (integrated risk), 3) Dig Down! (critical processes), 4) Aim High! (innovation & value); 5) Line Up! (systems alignment); and Think Again! (audit & review). Each step is captured in Figure 2 and briefly explained below. Of course, the process must also remain flexible enough to be adapted to each company context and to different industry sectors. The first step of the CIV process is Stakeholder Materiality Analysis, which systematically identifies and prioritises all stakeholders – including customers, employees, shareholders, suppliers, regulators, communities and others – before mapping their needs and expectations and analysing their materiality to the business. This includes aligning with the strategic objectives of the organization and then driving through to result measurables, key processes and process measurables. The stakeholder materiality analysis is the first level of integration and should be conducted simultaneously for quality, cost, products, environment, health and safety and social responsibility. The analysis helps to shape a comprehensive set of goals and objectives, as well as the overall scorecard of the organization. When conducted holistically as a part of the organization’s annual setting of goals, objectives and budgets, it seamlessly integrates into how the business operates. A similar approach was developed and fine-tuned by Omnex for Ford Motor Company in a process called the Quality Operating System. In parallel with the Stakeholder Materiality Analysis, the risks to the business are analysed through an Integrated Risk Assessment. This means the identification and quantification of quality, cost, product, environment, health and safety and social responsibility risks, in terms of their potential affect on the company’s strategic, production, administrative and value chain processes. The risk measures developed need to be valid for all the different types of risks and different entities of the business, and mitigation measures identified. The first two steps of Stakeholder Analysis and Risk Assessment are requirements of the new ISO 9001, ISO 14001 and ISO 45001 (formerly OHSAS 18001) standards slated to come out in the next few years. For example, in the new ISO 9001 that is planned for release in 2015, it is called ‘Understanding the Needs and Expectations of Interested Parties’ and ‘Actions to Address Risks and Opportunities’. The evolution of the ISO standards is indicative of a shift in global mind-set (since ISO represents over a 100 different countries) to prioritising stakeholder engagement and risk management. 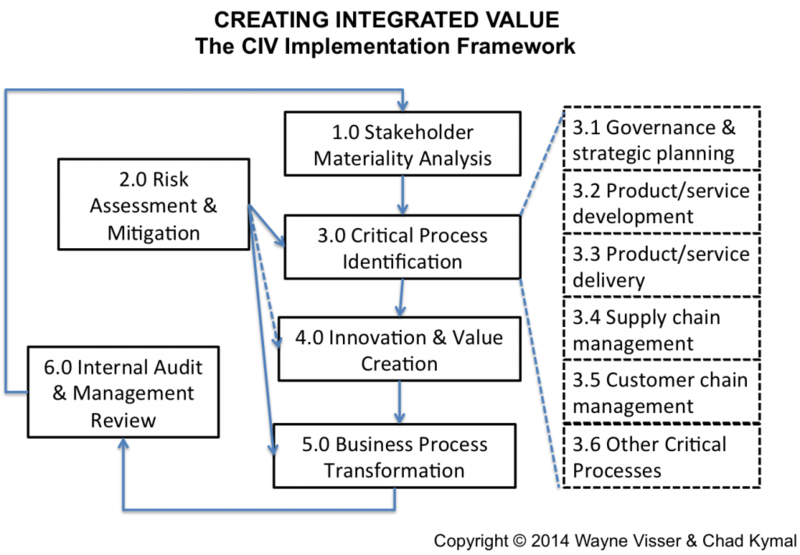 In step 3, the Stakeholder Materiality Analysis and Integrated Risk Assessment are used to identify critical business processes, using the Process Map of the organization. It is likely that the most critical processes – in terms of their impact on SQELCH issues – will include Governance & Strategic Planning, Product or Service Development, Product or Service Delivery, Supply Chain Management, and Customer Chain Management. There may also be others, depending on the particular business or industry sector. This Critical Processes list should also include the most relevant sub-processes. Step 4 entails the Innovation and Value Identification element. Using the Net Zero/Net Positive strategic goals, or others like Stuart Hart’s sustainable value framework, each of the critical processes is analysed for opportunities to innovate. Opportunity analysis is followed by idea generation and screening and the creation of a Breakthrough List. This is the chance for problem solving teams, Six Sigma teams, Lean teams, and Design for Six Sigma teams and others to use improvement tools to take the company towards its chosen transformational goals. The improvement projects will continue for a few months until they are implemented and put into daily practice. In Step 5, the requirements of the various SQELCH standards most relevant for the organization, together with the transformational strategic goals, are integrated into the management system of the organization, including the business processes, work instructions and forms/checklists. Process owners working with cross-functional teams ensure that the organizational processes are capable of meeting the requirements defined by the various standards and strategic goals. This is followed by training to ensure that the new and updated processes are understood, implemented and being followed. Integration has one final step, Internal Audit and Management Review, which creates the feedback and continuous improvement loop that is essential for any successful management system. This means integrating the value creation process into the governance systems of organization, including Strategic Planning and Budgeting, Management or Business Review, Internal Audits, and Corrective Actions. This is what will ensure that implementation is happening and that the company stays on track to achieve its transformational goals. To conclude, we believe Creating Integrated Value, or CIV, is an important evolution of the corporate responsibility and sustainability movement. It combines many of the ideas and practices already in circulation, but signals some important shifts, especially by using the language of integration and value creation. These are concepts that business understands and can even get excited about (whereas CSR and sustainability tend to be put into peripheral boxes, both in people’s heads and in companies themselves). More critical than the new label or the new language is that CIV is most concerned with implementation. It is a methodology for turning the proliferation of societal aspirations and stakeholder expectations into a credible corporate response, without undermining the viability of the business. On the contrary, CIV aims to be a tool for innovation and transformation, which will be essential if business is to become part of the solution to our global challenges, rather than part of the problem. Visser, W. and Kymal, C. (2014) Creating Integrated Value: Beyond CSR and CIV to CIV, Kaleidoscope Futures Paper Series, No. 3. It is interesting to note that the revised ISO 14001 being planned for release in 2016 includes a life cycle perspective for all aspects of operations including product design and delivery. What is Web 2.0 Really? Wikipedia defines Web 2.0 as ‘web applications that facilitate interactive information sharing, inter-operability, user-centred design and collaboration’. The term owes its origins to a 1999 article by IT consultant Darcy DiNucci, which challenged programmers to adapt to the spread of portable Web-ready devices. The concept was broadened out in 2005 by online media pioneer Tim O’Reilly, who gave contrasted Web 1.0 and Web 2.0 using examples: DoubleClick versus Google AdSense, Britannica Online versus Wikipedia, personal websites versus blogging, publishing versus participation, directories (taxonomy) versus tagging (folksonomy) and stickiness versus syndication, to mention but a few. In 2006, Don Tapscott and Anthony Williams showed how Web 2.0 was set to disrupt how markets operate and how businesses are organised. They called this new paradigm ‘wikinomics’, defining it as ‘the effects of extensive collaboration and user-participation on the marketplace and corporate world’. 4) Acting globally, which involves embracing globalization and ignoring physical and geographical boundaries at both the corporate and individual level. Another Web 2.0 building block is Chris Anderson’s concept of ‘The Long Tail’ – named after the area of a statistical distribution curve where it approaches (but never quite meets) the axis. Anderson’s breakthrough idea was that, in a Web 2.0 era, selling less to more people is big business. The Long Tail questions the conventional wisdom that says success is about generating ‘blockbusters’ and ‘superstars’ – those rare few products and services that become runaway bestsellers. 4) The Long Tail revolution has been made possible by the digital age, which has dramatically reduced the costs of customized production and niche distribution. Visser, W. (2013) Ten Web 2.0 Trends Shaping the Future of Business, Kaleidoscope Futures Paper Series, No. 2. This paper argues that CSR, as a business, governance and ethics system, has failed. This assumes that success or failure is measured in terms of the net impact (positive or negative) of business on society and the environment. The paper contends that a different kind of CSR is needed if we are to reverse the current direction of many of the world’s most pressing social, environmental and ethical trends. The first part of the paper reviews business’s historical progress over the Ages and Stages of CSR: moving through the Ages of Greed, Philanthropy, Marketing and Management, using defensive, charitable, promotional and strategic CSR approaches respectively. The second part of the paper examines the Three Curses of Modern CSR (incremental, peripheral and uneconomic), before exploring what CSR might look like in an emerging Age of Responsibility. This new CSR – called systemic or radical CSR, or CSR 2.0 – is based on five principles (creativity, scalability, responsiveness, glocality and circularity) and forms the basis for a new DNA model of responsible business, built around the four elements of value creation, good governance, societal contribution and environmental integrity. My starting point for any discussion on CSR – by which I mean corporate sustainability and responsibility, but choose whichever label you prefer (corporate social responsibility, corporate citizenship, sustainability, business ethics) – my starting point is to admit that CSR has failed. The logic is simple and compelling. A doctor judges his/her success by whether the patient is getting better (healthier) or worse (sicker). Similarly, we should judge the success of CSR by whether our communities and ecosystems are getting better or worse. And while at the micro level – in terms of specific CSR projects and practices – we can show many improvements, at the macro level almost every indicator of our social, environmental and ethical health is in decline. I am not alone in my assessment or conclusion. Paul Hawken stated in The Ecology of Commerce (1994) that ‘if every company on the planet were to adopt the best environmental practice of the “leading” companies, the world would still be moving toward sure degradation and collapse.’ Unfortunately, this is still true. Jeffrey Hollender, founder and CEO of Seventh Generation, agrees, saying: ‘I believe that the vast majority of companies fail to be “good” corporate citizens, Seventh Generation included. Most sustainability and corporate responsibility programs are about being less bad rather than good. They are about selective and compartmentalized “programs” rather than holistic and systemic change’ (Hollender & Breen, 2010). Visser, W. (2012) The Future of CSR: Towards Transformative CSR, or CSR 2.0, Kaleidoscope Futures Paper Series, No. 1. Wayne Visser’s CSR 2.0 Model provides a compelling vision of how business can create transformative improvements in society and the environment. Otto Scharmer’s Theory U describes how profound personal and collective change really happens. This paper explores how these two conceptual approaches can be aligned, thus providing insights into how to create the profound innovation and transformative change needed in the realm of corporate sustainability and responsibility. Corporate sustainability and responsibility, systemic CSR, transformative CSR, CSR 2.0, Theory U, U-process, leadership, business, adoption, transformative change. CSR 2.0, or radical CSR, provides a compelling vision for transforming the role of business in society. Essentially it advocates a paradigm shift in which the purpose of business is redefined: CSR or sustainability-related activities are no longer simply another means towards a narrow, shareholder-focused commercial end. Rather, CSR becomes a purpose in and of itself. It is an end-state in which business’s interactions with society and the earth are inherently sustainable and responsible. Companies only provide products and services that enhance our wellbeing, without sacrificing the environment or human dignity . CSR 2.0 becomes transformative by shifting the organizational perspective from isolation (us versus them, business versus society) to relationship: operations connected to and serving society and the world. The essence of sustainability is about honoring and advancing such relations, among ourselves, within ourselves and with the earth . These three dimensions of interconnectivity in turn address the triple crises of social, spiritual and ecological disintegration . CSR 2.0 is instructive as it helps us to see how organizations typically move through ‘ages and stages’ from greed-centered, philanthropic, marketing and strategic approaches to a more sustainable way of working and living; a journey that eventually leads to a transformative approach to CSR. Boundaries in our thinking become more fluid or diminish and our thinking becomes more inclusive. For instance, we stop thinking about business and CSR as separate categories; the essence of doing business, of innovation and of sustainability merge. In the process, renewed relationships are formed. CSR 2.0 is also innovative, proposing five principles (creativity, scalability, responsiveness, glocality and circularity) as a coherent base for a new model of sustainable and responsible business, in which governance and leadership are integrated with value creation, societal contribution and environmental integrity . CSR 2.0 reflects the most advanced stage of CSR practice, shifting from a cost-perspective on CSR to perceiving CSR as an opportunity . However, most corporations still operate from the mindset that embracing CSR/sustainability is a market-savvy way to improve reputation and brand, or at least “that it does no harm to financial performance” . Dominance of short-term thinking, shareholder-value and financiers’ power are still deeply ingrained in the corporate and collective way of thinking and doing. The paper aims to create a clearer understanding of the nature of sustainability leadership and how it can contribute to transformational change. It does this by locating sustainability within the leadership literature, defining the concept of sustainability leadership, and presenting a model of sustainability leadership in practice. The model was tested with a sample of senior business leaders and refined in line with their feedback. The model presents insights on sustainability leadership in three areas: context, individual characteristics, and actions. The model is illustrated using quotes from senior business leaders that are focused on sustainability in their organisations. This paper is based on research conducted by the University of Cambridge Programme for Sustainability Leadership (CPSL), which works with business, government and civil society to build the capacity of leaders, both to meet the needs of their stakeholders and to address critical global challenges. The paper is an attempt to create a clearer understanding of the nature of sustainability leadership and how it can contribute to transformational change. The Model of Sustainability Leadership that we have developed was corroborated by interviews with the following business leaders, conducted in 2010: Neil Carson, CEO of Johnson Matthey; Ian Cheshire, CEO of Kingfisher; Jeffrey Immelt, CEO of General Electric; Philippe Maso, CEO of AXA; Jan Muehlfeit, Chairman of Microsoft Europe; Truett Tate, Group Executive Director: Wholesale, for Lloyds Banking Group; José Lopez, Executive Vice President: Operations and GLOBE of Nestle; and Sandy Ogg, Chief Human Resources Officer for Unilever. The paper and the model are illustrated by extensive quotations from these interviews. De Vries (2001) reminds us that the Anglo-Saxon etymological root of the words lead, leader and leadership is laed, which means path or road. 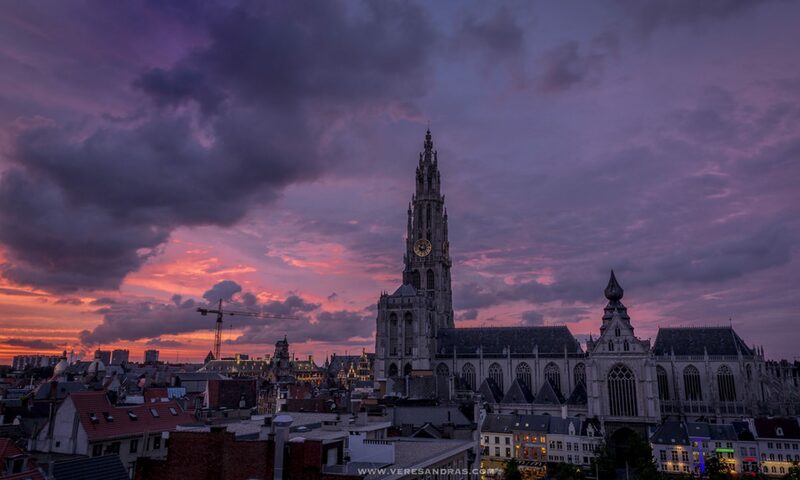 The verb means to travel. Thus a leader is one who shows fellow travellers the way by walking ahead. He also suggests that leadership – which focuses on the effectiveness of strategy – is different to management – which deals with the efficiency of operations. Ian Cheshire (2010), CEO of Kingfisher, says “leadership is about getting people to go where they wouldn’t have gone on their own”. Rather more flamboyantly, management guru Tom Peters (1989) suggests leadership is about “discovering the passion, persistence and imagination to get results, to be able to find the Wow factor and to be able to think the weird thoughts necessary to learn and thrive in a disruptive age”. In CSR circles, we see the task of creating a more equitable and sustainable world as both a serious challenge and an enormous opportunity. We are convinced that without bold and effective leadership – at a political, institutional and individual level – we will fail to resolve our most serious social and environmental crises. We will also miss out on the vast business opportunities presented by society’s transition to a sustainable economy. Over the past few years, in response to these global challenges and opportunities, we have seen more and more evidence of CSR leadership emerging, albeit not nearly enough. In order to better understand what makes these leaders effective catalysts for positive change, I have been conducting research with the University of Cambridge Programme for Sustainability Leadership (CPSL), mainly focused on individual leaders in business. In this short paper, I present some of our initial findings and conclusions. Someone who can craft a vision and inspire people to act collectively to make it happen, responding to whatever changes and challenges arise along the way. The Contingency/Interactionist school, which is about the interaction between the individual leader and his/her framing context. Leadership is relational. It is something you do with people, not to people. Put simply, you cannot be a leader without followers. Like all relationships, it needs to be monitored and cultivated. Leadership is non-hierarchical. Formal authority or a title doesn’t make you a leader. Leaders can be found at all levels. Leadership is contextual. You need to size up and tap into what exists around you and then bring more to the party. Visser, W. (2011) The Nature of CSR Leadership: Definitions, Characteristics and Paradoxes, CSR International Paper Series, No. 4. This article argues that CSR, as a business, governance and ethics system, has failed. This assumes that success or failure is measured in terms of the net impact (positive or negative) of business on society and the environment. Hence, we need a different kind of CSR if we are to reverse the current direction of many of the world’s most pressing social, environmental and ethical trends. The article reviews business’s historical progress over the Ages and Stages of CSR: moving through the Ages of Greed, Philanthropy, Marketing and Management, using defensive, charitable, promotional and strategic CSR approaches respectively. It then examines the Three Curses of CSR 1.0 (incremental, peripheral and uneconomic), before exploring what CSR might look like in an emerging Age of Responsibility. This new CSR – called systemic or radical CSR, or CSR 2.0 – is based on five principles (creativity, scalability, responsiveness, glocality and circularity) and forms the basis for a new DNA model of responsible business, built around the four elements of value creation, good governance, societal contribution and environmental integrity. If CSR is the answer, what is the question? First let me say what I understand by CSR. I take CSR to stand for Corporate Sustainability and Responsibility, rather than Corporate Social Responsibility, but feel free use whichever proxy label you are most comfortable with. My definition is as follows: CSR is the way in which business consistently creates shared value in society through economic development, good governance, stakeholder responsiveness and environmental improvement. Put another way, CSR is an integrated, systemic approach by business that builds, rather than erodes or destroys, economic, social, human and natural capital. Given this understanding, my usual starting point for any discussion on CSR is to argue that it has failed. I provide the data and arguments to back up this audacious claim in my new book, The Age of Responsibility, but the logic is simple and compelling. A doctor judges his/her success by whether the patient is getting better (healthier) or worse (sicker). Similarly, we should judge the success of CSR by whether our communities and ecosystems are getting better or worse. And while at the micro level – in terms of specific CSR projects and practices – we can show many improvements, at the macro level almost every indicator of our social, environmental and ethical health is in decline. Visser, W. (2011) The Ages and Stages of CSR: Towards the Future with CSR 2.0, CSR International Paper Series, No. 3. First published in Social Space 2011. One of the proposed antidotes to the Age of Greed is corporate social responsibility (CSR), which has been debated and practiced in one form or another for more than 4,000 years. For example, the ancient Vedic and Sutra texts of Hinduism and the Jatakas of Buddhism include ethical admonitions on usury (the charging of excessive interest) and Islam has long advocated Zakat, or a wealth tax. The modern concept of CSR can be more clearly traced to the mid-to-late 1800s, with industrialists like John H. Patterson of National Cash Register seeding the industrial welfare movement and philanthropists like John D. Rockerfeller setting a charitable precedent that we see echoed more than a hundred years later with the likes of Bill Gates. Despite these early variations, CSR only entered the popular lexicon in the 1950s with R. Bowen’s landmark book, Social Responsibilities of the Businessman. The concept was challenged and strengthened in the 1960s with the birth of the environmental movement, following Rachel Carson’s critique of the chemicals industry in Silent Spring, and the consumer movement off the back of Ralph Nader’s social activism, most famously over General Motors’s safety record. The 1970s saw the first widely accepted definition of CSR emerge – Archie Carroll’s 4-part concept of economic, legal, ethical and philanthropic responsibilities, later depicted as a CSR pyramid – as well as the first CSR code, the Sullivan Principles. The 1980s brought the application of quality management to occupational health and safety and the introduction of CSR codes like Responsible Care. In the 1990s, CSR was institutionalised with standards like ISO 14001 and SA 8000, guidelines like the Global Reporting Initiative and corporate governance codes like Cadbury and King. The 21st century has been mostly more of the same, spawning a plethora of CSR guidelines, codes and standards (there are more than 100 listed in The A to Z of Corporate Social Responsibility), with industry sector and climate change variations on the theme. Why is all this potted history of CSR important in a discussion about the future? Well, first, we must realise that CSR is a dynamic movement that has been evolving over decades, if not centuries. Second, and perhaps more importantly, we must acknowledge that, despite this seemingly impressive steady march of progress, CSR has failed. CSR has undoubtedly had many positive impacts, for communities and the environment. Yet, its success or failure should be judged in the context of the total impacts of business on society and the planet. Viewed this way, as the evidence already cited shows, on virtually every measure of social, ecological and ethical performance we have available, the negative impacts of business have been an unmitigated disaster, which CSR has completely failed to avert or even substantially moderate. Visser, W. (2010) The Rise and Fall of CSR: Shapeshifting from CSR 1.0 to CSR 2.0, CSR International Paper Series, No. 2. This paper looks at what motivates sustainability managers to devote their time and energies to addressing social, environmental and ethical issues. It is rooted in the literature on the role of individuals as change agents for corporate sustainability, in particular in their capacity as environmental or social ‘champions’. The paper presents in-depth research among sustainability managers, providing a rich, nuanced understanding of different types of sustainability change agents. It identifies four such types – Experts, Facilitators, Catalysts and Activists – and uncovers the pivotal role of values, inspiration, expertise, empowerment, strategic thinking and social contribution as sources of meaning for these purpose-inspired managers. The findings deepen our understanding of the psychological dimensions of corporate sustainability management, and provide a useful tool for improving individual and team performance, enhancing recruitment and retention of sustainability talent, and developing more effective organisational leadership for sustainability. As social, environmental, and ethical issues like persistent poverty, climate change, financial market instability and economic globalisation continue to move up the geo-political and economic agendas, corporate sustainability is increasingly touted as a timely and necessary response by business (Dunphy et al., 2003; Shrivastava, 1995; Zadek, 2004). Viewed in this way, sustainability can be thought of as a conceptual framework and practical mechanism for creating change that results in improved social, environmental and ethical conditions (Van Marrewijk, 2003). Attention to corporate sustainability has tended to focus on how change can be achieved at the organisational level (Benn, et al. 2006; Dunphy et al., 2003). By contrast, comparatively little research exists on the role of the individual as a change agent for sustainability (Sharma, 2002). What literature there is on corporate sustainability and the individual level typically focuses on four areas: 1) The importance of values congruence between managers/employees and organisational values (Fryxell and Lo, 2003; Hemingway and Maclagan, 2004; Van Marrewijk and Werre, 2002); 2) the instrumental association between individual concern, knowledge and commitment and corporate social and environmental responsiveness (Bansal and Roth, 2000; Keogh and Polonsky, 1998); 3) narrative accounts by sustainability managers of corporate ‘greening’ (Fineman, 1997; Georg and Fussel, 2000; Starkey and Crane, 2003); and 4) the role of sustainability managers as champions, entrepreneurs or agents of change in their organisations (Andersson and Bateman, 2000; Prakash, 2001; Walley and Stubbs, 1999).